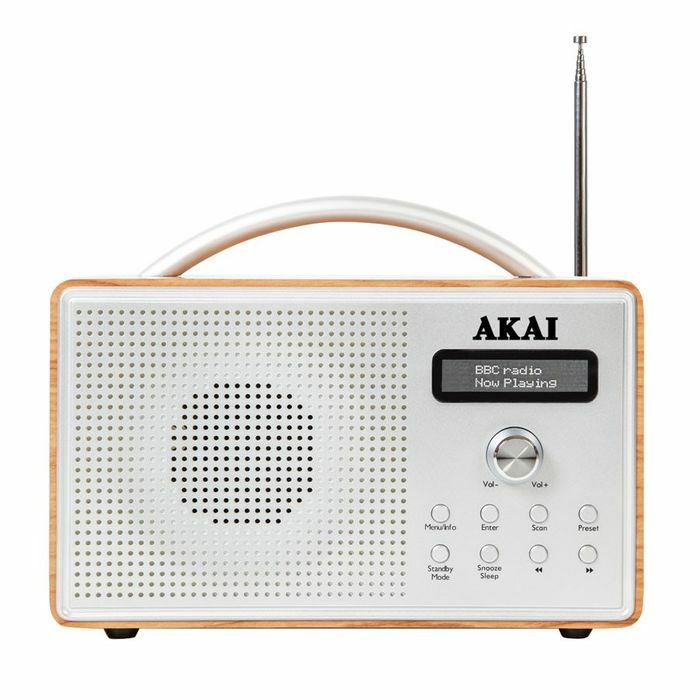 Listen to all your favourite stations in style with this wooden DAB radio from Akai. Boasting 20 pre-set stations which will give you your favourites at the touch of a button, this radio also features an LCD screen set into the oak which is stylish and easy to read. The crystal-clear sound quality gives you an excellent listening experience thanks to the four-watt PMPO speakers. What’s more, a built-in alarm clock means you can wake up to the sounds you love, whilst the handy sleep timer lets you enjoy a few more precious minutes in bed. You can choose to either power this radio via the mains, or pop four C batteries in and take it on-the-go. With an elegant oak design and sturdy carrying handle, it's a stylish addition to any music lover’s home. Built-in alarm clock – Wake up to your favourite station every morning. Quality sound – This wooden DAB radio boasts crystal-clear audio for the ultimate listening experience. 20 pre-set stations – Choose your favourite stations at the touch of a button.